​ Running a tap until the water is cold wastes about 4 litres each time. Why not fill a covered jug and put it in the fridge for later use. 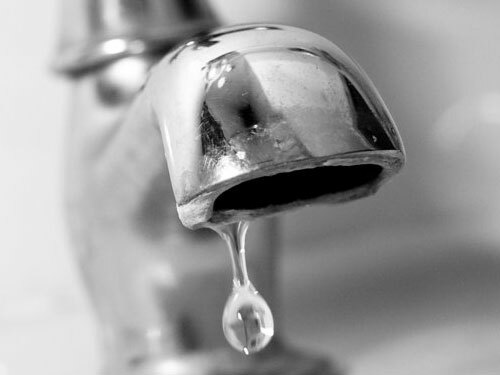 A dripping tap can lose 90 litres of water a day, that’s a lot if it carries on for weeks or even months. Over a year that will cost you around £65 and as the saying goes ‘it’s pouring money down the drain’. Save water when washing vegetables and dishes by using a bowl of cold water rather than a running tap. This saves about 5 litres of water every time, then recycle the water by using it to water your household plants. Using a sink of water to wash crockery and cutlery twice a day rather than leaving the hot tap running could save money on your gas bill and about £30 on your water bill (if you have a water meter). ‘Click point’ taps that inhibit the flow rate in stages can be fitted to kitchen or bathroom sinks. 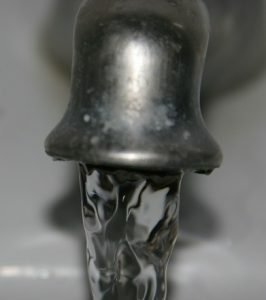 A dripping tap can lose 90 litres of water a day. ​A standard programme uses 10 litres of water, compared to dishwashers on an eco-setting only using 7 litres. 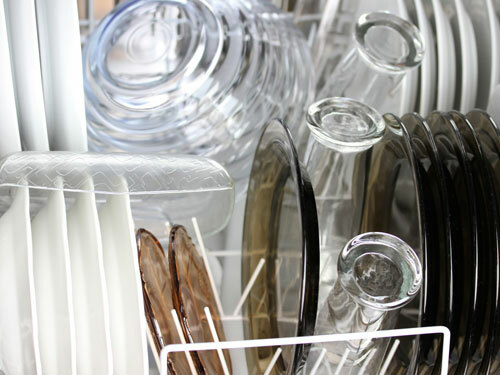 Looking to replace your dishwasher? Look for products with the new Water Efficient Product Label and/or the Waterwise Recommended Checkmark as these models can help you to save water, energy and money. Run your dishwasher only when full to capacity. 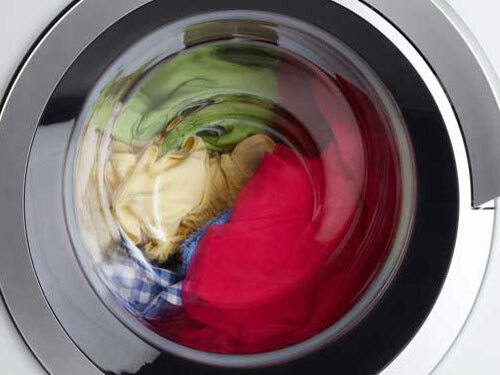 Washing a half load simply uses and wastes twice the water, detergent and energy required. Run your dishwasher only when full to capacity. Reduce the number of clothes washes you do per day by always making sure you have a full load. This will save water, energy, detergent and your money. ​​ Looking to replace your washing machine? Look for products with the new Water Efficient Product Label and/or the Waterwise Recommended Checkmark as these models can help you to save water, energy and money. Run your washing machine only when full to capacity. Washing a half load simply uses and wastes twice the water, detergent and energy. Washing clothes in cold water helps to retain dark and vibrant colours, reduces colour bleeding and reduces wrinkling – result your clothes last longer and saves you money. Run your washing machine only when full to capacity. ​Don’t boil more water than needed when making a cup of tea. 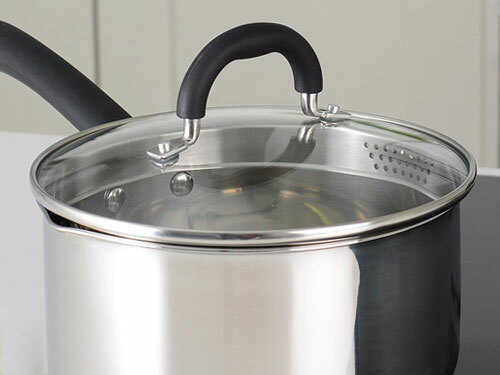 Keeping the lid on saucepans reduces the amount of water lost as steam, so you don’t have to put as much in. This saves water and energy as it takes less time for the water to heat up to cook your food. 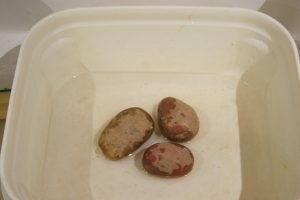 Re-use the water from drained vegetables as the basis for gravy or soup. Alternatively let it cool and use to water plants around the house or in the garden. Keep the lid on saucepans.